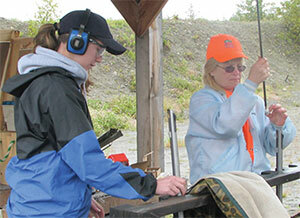 This is a description of the Instructor-led muzzleloader education proficiency shoot only. It is not for Online muzzleloader field day students and does not satisfy their Online Field Day requirement. Students completing the Instructor-led muzzleloader education course may not attend an Online Field Day to complete their certification. All applicants for muzzleloader education certification must successfully complete a standardized proficiency shoot. Each student will use muzzleloader firearms, projectiles, and powder provided by the ADF&G Hunter Information & Training Program. The student can take as many practice shots as they need to feel comfortable at the 50-yard proficiency distance. The student will use a Leupold 100-yard target during the practice setting. NOTE: Students cannot use their practice target to pass their proficiency shoot. The proficiency shoot must be completed on the blue 8" target provided by the instructor. Each student will choose their bullet and powder choice based on their practice session. The student will choose a shooting position (standing, kneeling, sitting, or prone) and cannot have the aid of any external rest. Five shots will be taken at 50-yards "off-hand." Four of the five shots must be within an 8" circle. The instructor will be looking for a "group", not necessarily "bullseye" hits. All five shots should be on paper or the instructor must verify that shots were indeed within the 8" circle required to pass. Regardless of the shooting skills demonstrated, a disruptive or unsportsmanlike attitude by a student during any portion of the shooting proficiency may result in a failing grade being assigned by the instructor. If the student does not successfully complete all portions of the course, they must re-take the entire course.